Super quick, super easy to make and super delish semolina-banana pancakes. Eggless pancakes, best enjoyed with some fresh homemade butter. Soupy, watery gravy of cowpeas/black eyed peas. It's called bagde saaru in Konkani. It's delicious, simple & easy to make. Rice & this saaru is all you need. A traditional carrot kosambri recipe that's tasty, healthy and nutritious. 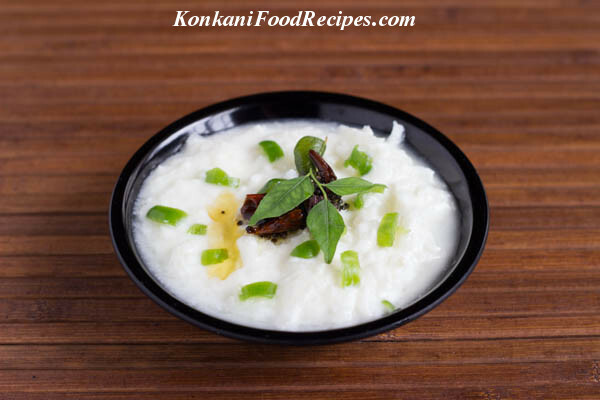 Very quick and easy recipe to make a flavourful salad in a traditional konkani style. A very delicious radish salad that takes no time to prepare. I never ate radish until I tasted this salad. So, you gotta try this salad!!! Fried okra in curds with a delicious seasoning called as benda gojju in Konkani is a very cooling side dish served as an accompaniment with rice. A bowl of rice, scrumptious potato gojju and some buttermilk chillies! Heavenly dinner ready in just 30 minutes! And it's comfort food at it's best. Potato and peas in a thick coconut based gravy called gashi with caramelised onions that taste and smell heavenly is a authentic konkani curry. Dalithoy is the KING of Konkani cuisine. Dalithoy is the most basic and most loved dish of Konkani cuisine. Konkani's just cannot live without this daal.